How else do we explain this? Reds, Bengals, Bearcats. All of them breaking sports fans hearts for decades now. Each of them have had spurts of greatness, but other than the Reds, none of them have ever taken hold of their opportunity for championships. Everyone has always said how sad Cincinnati sports are, and how they are seemingly cursed. Surely that isn't true, but when FC Cincinnati was born and was off to such a hot and historic start, and suddenly fell ill to the same destiny as their local sports comrades, I'm starting to believe. So, Cincinnati fans, let's go on a very sad journey through the worst sporting catastrophe's this wonderful city has ever seen. We have look back at the worst, to understand the present. When Brian Kelly took over the Bearcats football team he had great success. So much so that in 2009 the team went 12-0 after an epic defeat of Pitt, won the Big East, ranked #3 in the nation, and was a Nebraska win over Texas away from going to the National Championship. Through the strangest events, Texas ended up winning off of a last second field goal sending the Bearcats to play Tim Tebow and Urban Meyer's Gators in the Sugar Bowl. However coward Brian Kelly left the Bearcats just days after their Big East title win and headed for Notre Dame. The headless Bearcats would go on to get destroyed 51-24 by the Gators. UC Football hasn't been great ever since. The year was 2005 and the Bengals were recovering from 14 consecutive losing seasons. Carson Palmer got his first starting season and brought the Bengals their first winning season and first playoff game since 1990. They had won the AFC North with a 11-5 record and were facing the Steelers in their historic playoff game. On the Bengals first offensive play of the game Palmer would throw a 66 yard pass to Chris Henry. However, Steelers lineman Kimo von Oelhoffen would fall into Palmer (with rather dirty fashion) and completely take out his knee. Palmer was carted off the field and wouldn't see the field again and wouldn't be the same for a long long time. Despite Jon Kitna's best efforts, the Bengals would lose and wouldn't make it back to playoffs until 2009 where they'd lose to the Jets. In 2012 the Reds were hot and would win 97 games even without Joey Votto for a vast stretch of the season. They dominated the NL Central and faced the San Francisco Giants in the NLDS. After winning the first two games in San Francisco, all the Reds needed was to win ONE of the next THREE games at Great American Ballpark here in Cincy. SF would win Game one 2-1. They win Game four 8-3. Down to Game five, a must win for both teams, the Reds would fall 6-4, blowing their 2-0 lead and losing three straight games at home in the Playoffs. They'd go on to lose to Pittsburgh in a Wild Card game the following season in 2013, and the Reds have not returned to the playoffs since, and have gotten considerably worse along the way. After the terrible 2010 season, the Bengals would enter a new era under AJ Green and Andy Dalton. A fierce defense and prolific offense would lead the Bengals to 5 straight playoff appearances. The first, in Dalton and Green's rookie year, would result in a 31-10 loss to the Texans. The second, a rematch against Houston in the first round, but they'd once again fall, this time 19-13. The third year put the Bengals against a totally beatable San Diego Chargers squad at home in Paul Brown Stadium. But Dalton had an abysmal game and they'd lose 27-10. The following year they traveled to Indianapolis to face the Colts, but would lose 26-10. Then came the 2015 season. The Bengals started out 8-0, they'd falter a little, but still finished atop the AFC North with a 12-4 record with the best Bengals squad in years and Super Bowl hopes high in the Queen City. However in Week 14 against the Steelers, Dalton would leave in the first quarter with a broken thumb, putting AJ McCarron behind center. He was good enough to beat the 49ers, and Ravens, and nearly upset the Broncos in a thriller that went to OT. However, the season came down to a McCarron lead team against the Steelers, in Cincinnati, in the first round of the playoffs. It was the definition of a hard fought, ugly match. The Bengals would go down 15-0 and Ben Roethlisberger would leave the field injured on a cart. Suddenly the Bengals find life in the 4th quarter and score 16 unanswered points to go up 16-15 with 1:50 left in the game. All Cincinnati needs to do is run the clock out. Jeremy Hill fumbles the ball. Big Ben comes back in, with less than a minute remaining and after a catastrophe of penalties on Burfict and Jones, the Steelers move into the field goal range and kick the winner. 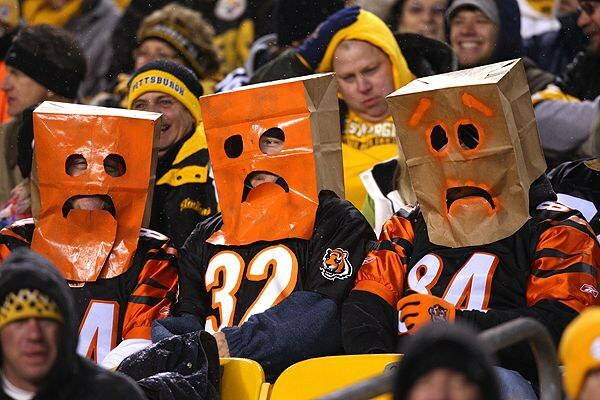 I'm still not sure if Cincinnati or the Bengals have recovered from the loss. Their following season didn't lead to the playoffs, and currently the Bengals are struggling to stay in the playoff race in 2017. The Orange and Blue started their franchise with a very successful first season. They secured the 3rd seed in the Eastern Conference and a home playoff game. They lost 2-1 to the Charleston Battery but the outlook on FCC was still incredibly good. Little did we know what we were in for when it came to their second season. The team went on an incredible US Open Cup run beating hated rivals Louisville FC, then the Columbus Crew, Chicago Fire, and NASL best Miami FC. It was an incredibly epic tournament and the Fire game was probably the greatest sporting event I've ever been to. However they then moved on to playing the New York Red Bulls in the semi-finals, whom no one really expected them to defeat. However, they took a 2-0 lead and were stunning the Red Bulls. But out of nowhere with only 15 minutes remaining, the Red Bulls would pull 2 goals back and tie the game. In extra time they go one to get the winner and end Cincinnati's cinderella run. While much of the fan base looked past the loss, it was still devastating at the time to come so close to beating a 3rd MLS team in a row, only to fall apart at the end. What might be even worse than losing the semi-final, the team was never the same since that game. They finished the final third of the season pretty badly while still securing a 6th place seed in the Eastern Conference. However FCC's abysmal road form lead to them losing in the first round 3-0 to the Tampa Bay Rowdies. Cincinnati has not advanced past the first round of a league playoff in decades. They've come so incredibly close, but have squandered every chance. I used to just think the Reds and Bengals were real bad, but now that FC Cincinnati has finished two seasons one and done in the playoffs, one can't help but wonder. Perhaps this is just a period of harsh luck for Cincinnati's sports teams, which will be followed by a period of unparalleled greatness. The Reds do not look to be improving anytime soon and the Bengals are stuck in a rut with Marvin Lewis at the helm. FC Cincinnati will be looking to rebuild this offseason so hopefully that yields better results next year. However, all Cincinnati fans can do now is bask in our disappointment.